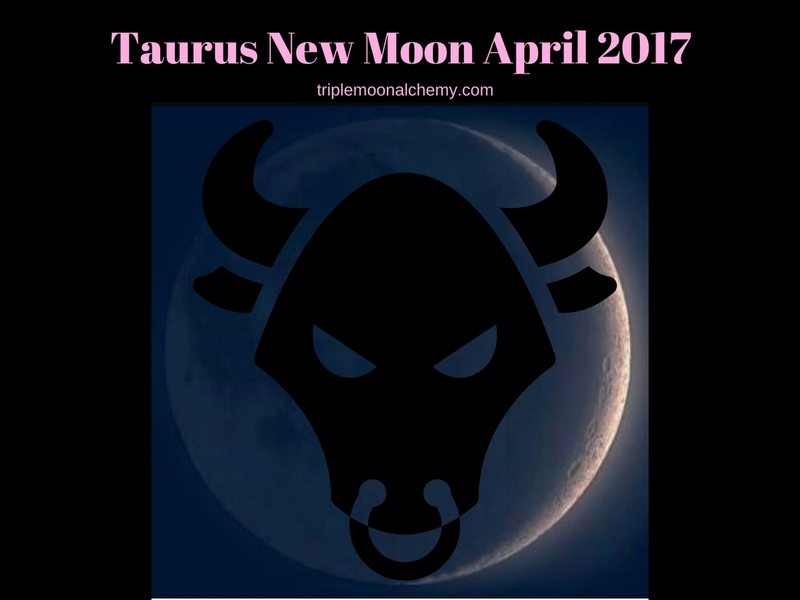 Taking a break from writing the next installment of the African spirituality series, I wanted to share about this New Moon in Taurus because it has something special for us. Every new moon is an opportunity to set new intentions, to become, again… and the New Moon on April 26th 2017 is no different. After the Dark Moon, a new one is revealed. This New Moon in Taurus will be the umph that we have been looking for. Maybe your magickal workings have had a passive effect lately. This New Moon brings a progressive power. Work those same spells again. Taurus always enjoys the finer things in life and in love. This moon is full of creative potential to help us find our sweet spot. This would be a wonderful time to work magick involving success of any kind. Workings about propelling forward into our dreams, goals, and plans. Because of the alignment of Uranus and Mercury, there is plenty of inventive energy swirling around in the ether. Grab some if you will. This moon will have a lot of us having sober thoughts too. Dreamy imagination gives way to concrete plans for manifestation, if we allow it. If you were wondering if now is the time to make that move, the answer is yes. Ride with the energy of this moon, and see your idea come to life. If the energy of the retrogrades has had you a bit sluggish and numb, this is your moon to break free. Ok, maybe not break free, more like wriggle yourself free slowly lol. If you harness it, you will have the energy, but it will take a couple weeks before you see evidence. Now is a good time to go back and re read some of those intentions from last month, check back to see what spells you have cast and what may need to be re worked. Be certain that what you are putting your energy towards is what you really want, and not what you kinda want. Why? So that you can use this moon to establish your desires for the coming months. You do not want to manifest something that you are not truly passionate about. Think of it like building your new house. As with all houses, it needs a firm foundation. Create your foundation by going over your plans (intentions) and creating workings that support those desires. Get your divination on if you seek clarity to know which way to go,or to get confirmation for the choices you make under this New Moon. Take a ritual bath or shower, burn some incense, light a few candles, and meditate on these things. Don’t miss this opportunity to expand and advance. Happy New Moon. If you haven’t already, please subscribe. You don’t want to miss out on new posts as they are available. You can do so HERE. Until next time. Blessed be. Ashe.